The private sector workers in Metro Manila who are receiving minimum wage will soon be getting an additional rate of P21 daily in their salaries. Based on Wage Order No. 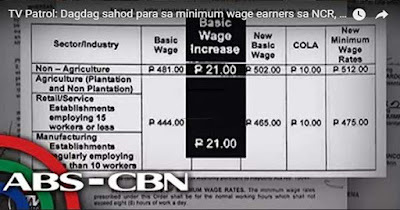 NCR-21, issued by the Regional Tripartite Wages and Productivity Board (RTWPB), the salaries of these workers in NCR with minimum pay will increase from P491 to P512. This may not be a big increase but an early Christmas gift for almost more than 6M minimum wage receiver in 17 cities and municipalities of Metro Manila. As stated on the Wage Order No. NCR-21, the additional wage rates per day will only apply to all minimum earners in private sectors in the region of Metro Manila regardless of their designation, position or the status of their employment. This will benefit the minimum wage receiver for non-agriculture workers in the region to P512 from P491 starting the end of September. Those in the agriculture sector, small retail, service and manufacturing establishments will get P475 from the previous P454.It is then concluded that domestic workers, employees of Barangay Micro Business Enterprises and even person under personal service of another are not covered by the P21 hike. The big question mark now is that, does it really enough to sustain the daily needs of these minimal receivers? Allan Tanjusay, the spokesman of Associated Labor Union (ALU) said that the P21 salary increase for minimum-wage earners is not sufficient to alleviate the current situation of our workers. The P21 increase in daily wage remain insufficient for families to cope with rising prices of goods and increasing costs of goods. The P21 is only 4.27% of the current P491 so it obviously did not lift workers out of poverty. Workers do not deserve this very small amount,’’ he said. The effectivity of the wage order will take effect within 15 days after its publication in general newspaper. How Much an Annulment in the Philippines?